Sitting down to watch Russell Crowe’s directorial debut, The Water Diviner, I conjured up this rather tenuous analogy in my jumbled thoughts. Film directors are a bit like football managers. Think about it, the manager is the central column of influence on a team; he may not coach the players individually, dabble in financial issues or actually step out on the pitch, but ultimately it’s his vision that guides the way his side loft, lump and leather the ball. Similarly, a film is moulded by the intangible perspective of the director. Like coaching staff, the directors’ crew of producers, actors and cinematographer are the ones who are translating the idea into reality. Essentially what I’m saying is that Jose Mourinho and Stanley Kubrick are one in the same. While not a necessity, quite often football managers are ex-pros that’ve made the transition from pitch to dugout. It would seem sensible to assume that those who have played the game their whole life will know tactically what works and how to get the best of a team of egotistical prima donnas. This is of course one of the sport’s great fallacies. Just because you can smash 30 yard volleys in for fun doesn’t mean you can organise eleven men into a cohesive unit, just ask Alan Shearer. For every Pep Guardiola or Johan Cruyff who have successfully won everything playing and managing, there are a couple of no hopers coasting into a job on name rather than merit. The directorial world of cinema may not be quite so introverted and bridled with nepotism, however there is a fair share of actors who’ve skipped the queue to get behind the all-powerful camera lens. Orson Welles, Robert Redford and Clint Eastwood are individuals who have had triumphant careers on screen as well as off it. Ryan Gosling, Kevin Spacey, Dustin Hoffman and Eddie Murphy are renowned actors (maybe not so much the latter) who have made rubbish films. Sadly for the hunky-action-hero-turned-affable-sweater-wearing-Dad-type Russell Crowe his foray into directing is rather more Diego Maradona than Alex Ferguson. The Water Diviner is a dozy, Sunday afternoon special that is marred by confused direction. You can squarely lay the blame with the director due to the fact that the story itself has all the ingredients for a great film. Russell Crowe casts himself as a grieving Australian father Joshua Connor who’s lost his three sons in WWI. With no bodies found, Connor travels across the world to Gallipoli in Turkey to find his sons and lay them to rest back home. Beyond having to contend with a totally alien cultural, Connor has to navigate a country ravaged by war and being carved up by the victorious British and warring Greeks. There’s more than enough material available for The Water Diviner to be a roaming historical epic in the mould of Ben Hur or Bridge over the River Kwai. Often the worst thing you can describe a person, thing or place as is ‘nice’. What that word means is boring, non-descript, weak, forgettable and ultimately, pointless. 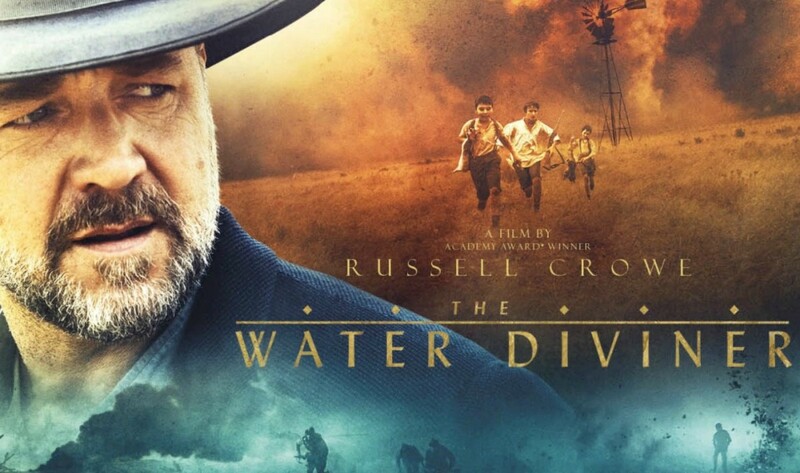 The Water Diviner is the cinematic definition of ‘nice’. It’s Crowe’s ‘nice’ direction along with Andrew Knight and Andrew Anastasios’ fist bitingly maudlin script that push the film into an excuse for a kip. Every stereotype you could conjure from the setting and scenario is flung into the mix. The Turkish militants have a song, drink and dance that resembles a laughable imitation of Paths of Glory or Casabalanca’s rousing military anthems. The British officers are officious and proper. Connor is the bewildered tourist who gets his bag stolen by loveable scamp in Istanbul’s bazar. When the English and Turkish army majors meet they bond over the fact they were both engineers before the war, enforcing that old adage that the enemy in war is no different to you. Beyond the clichés wizzing across the screen like misfiring shells, we’re faced with a minefield of corny predictability. Connor strikes up a wholly unbelievable friendship with the hotel owner Ayshe (Olga Kurylenko) and her son. This relationship is immediately undermined by the fact she’s a good 25 years younger than Crowe, the chemistry just isn’t there. Oddly the duo never manifest themselves romantically which seems to be out of sheer embarrassment for how daft it would be. The film’s lowest ebb comes when Connor, Ayshe and her son frolic in the water laughing in slow motion. It’s a truly nauseating spectacle. For war epics to be convincing there needs to be a sense of scale. Connor’s quest never gives us that sense of hopeless desperation and isolation amongst the war and chaos. The story itself moves along swiftly as everything falls into place for Connor with great serendipity and convenience, yet there’s an amateur look and feel present. Turkey is never shown in its full bustling glory, we’re only privy to alleys, alcoves and rooms which just accentuate the fact little of the film was actually filmed on location. The only real cinematography of note is the brief glimpses of the sweeping Australian Outback in the engulfing sunset. Then again, haven’t we seen that all before in Australia, Mad Max and Walkabout? As for Crowe, he’s on autopilot for his role as Connor. Most of the time he lapses into a bewildered middle distance stare to convey some needed anguish or confusion. Directing wise it’s not any better as he attempts to utilise every shot ever created. There’s slow motion, lens filters, warping the shot, filming from directly overhead and reverse panning. Rather than enhance the experience, the variety of shots and effects is just distracting. It’s a bit like trying to cook dinner using pepper, paprika, basil, thyme, mustard, nutmeg and saffron in one dish, wholly excessive. 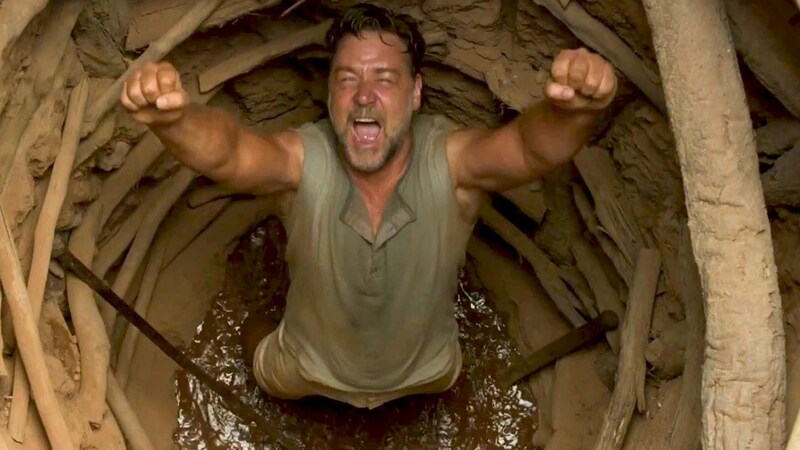 The Water Diviner isn’t unwatchable or life threatening, it’s merely ‘nice’. The short bouts of action are surprisingly gruelling and the narrative paces along quickly enough to keep you engaged for the duration, not that you’ll care much by the end. Crowe’s move to directing echoes a sentimental triteness found in his own films like Gladiator and Robin Hood. Perhaps if his film had the budget and script of Gladiator it would be ok, instead we’re left with a poor man’s Indiana Jones meeting The Last Exotic Marigold Hotel. As the earlier metaphor went, Russell I think it’s best you get your boots and get back out on that pitch.